I have a confession to make. 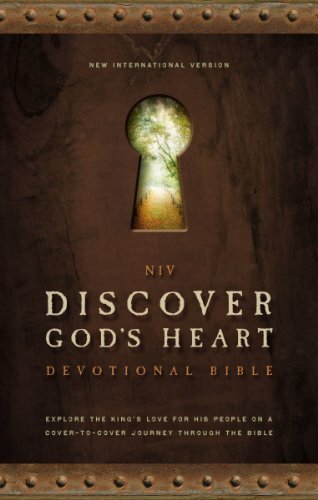 I was a little tentative to review Zondervan’s NIV Discover God’s Heart Devotional Bible (henceforth, God’s Heart). Though I have been impressed with Zondervan’s efforts in the devotional Bibles department, I really dislike these styles of Bible. They do not appeal to me. I reluctantly said yes and then it sat on my shelf. Although a fan of the NIV, I am not so much a fan of reading plans inside of Bibles. I noticed that God’s Heart contained multiple reading plans. I prefer Bibles with no additional content. This one has an appendix full of additional 30 day reading plans. Things were not off to the best start. Then I noticed that the 312 devotionals followed a daily Scripture plan through the entire Bible, utilizing three sections: “God’s story,” “The King’s Heart,” and “Insight.” These devotions explain each day’s text, show what it reveals about God, and provide technical, historical, or theological insights (v). Instead of being merely cherry picked passaged for devotions, God’s Heart strives to reveal “God’s heart” in the whole of Scripture. And the devotional work of Laurin Makohon Greco is quite good. For myself this was a shock since Greco states on her website, “I wrote this Bible project for my college-aged self.” This attitude of communicating God’s love certainly comes through in the devotions of God’s Heart but not without valid theological explanations. For the most part, the devotions of God’s Heart are entirely God-centered. God is the main character and the text reveals things about Him. There are no devotions with moral waxing or self-help deism. But God relates to mankind. The Scripture is God’s revelation to man. So Greco naturally writes about God’s heart towards His people. I could be obnoxiously critical of how God’s Heart portrays God’s “wanting” His people. Specifically the way it’s “God wants you” style. But frankly, Greco makes the depth of human depravity quite clear. She leaves no room for us deserving God’s love. I particularly love how she depicts sin as “a ravenous, hereditary cancer” (7), the flood as “no unfeeling destruction” (11), and God’s attitude of “I don’t need you…But I want you” (74). In conclusion, Discover God’s Heart Devotional Bible provides wonderful devotions for a straight-through reading of the Scriptures. I am not sure how valuable it will be as a long-term Bible. But I am once again impressed with the quality of devotional/study material put forth by Zondervan. With God-centered devotions and an emphasis on God’s love despite extensive human frailty, God’s Heart is worth a purchase for interested readers.